Today at Star Wars Celebration Europe in London a ton of new information, footage and photos were revealed at the panel for Rogue One: A Star Wars Story. Fans waited all night in line to catch a glimpse of the cast and crew on stage as they discussed the film and previewed a behind the scenes sizzle reel. In addition, during the panel Director Gareth Edwards presented the poster for the film, which was subsequently given to attendees of the panel. 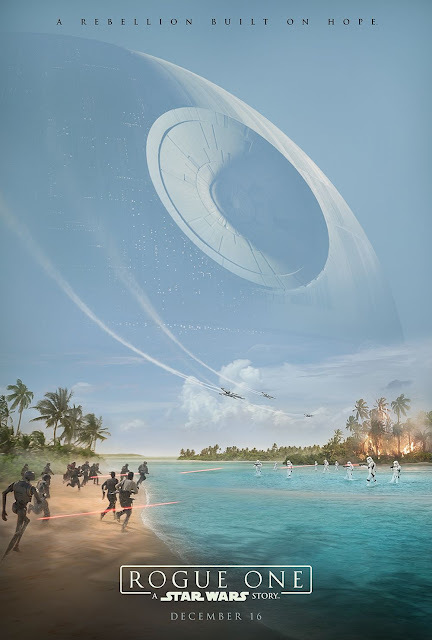 The amazing artwork features Rebels and Imperials battling on the beaches of the planet Scarif in the shadow of the Death Star! Beautiful. It definitely looks different than anything else we've seen so far. where will they hold the Europe celebration once Britain has gone ?